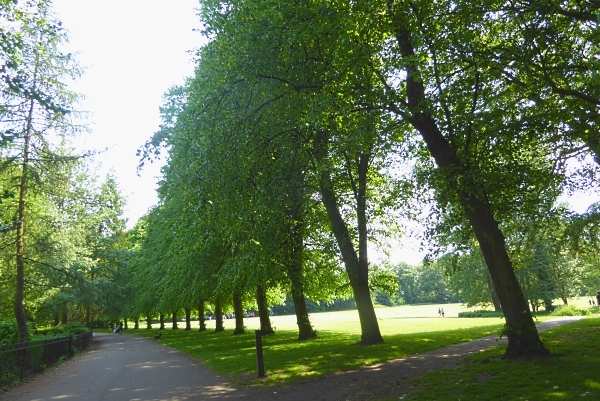 Calderstones Park has the greatest collection of rare trees in the north-west of England. Everywhere you look there is something wonderful, and we have only scratched the surface in identifying them. The plant collector was called Charles McIver, a Liverpool shipping magnate, who was one of the founders of the Cunard Line. He lived on the Calderstones estate from 1875, and most of the rare plantings are thought to be his. Liverpool Corporation bought the estate in 1902, then the adjoining Harthill estate in 1913, making a park of 126 acres altogether. We entered the park at the south-west entrance, off Allerton Road, where there is a carpet of Pink Purslane under the trees. It was another hot and sunny day, and we soon found we were all wearing too many layers! 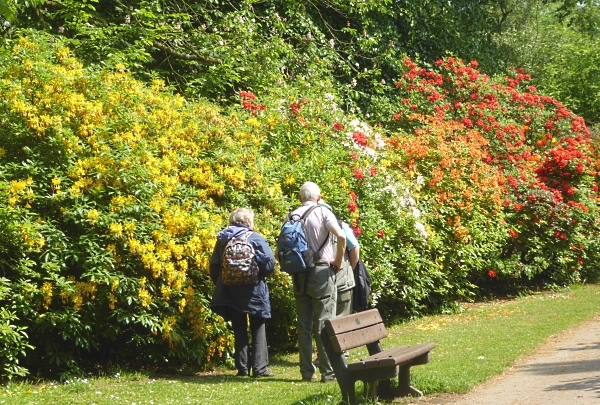 The flowers along the Rhododendron and Azalea Drive were superb, with the yellow ones producing a knock-out scent. 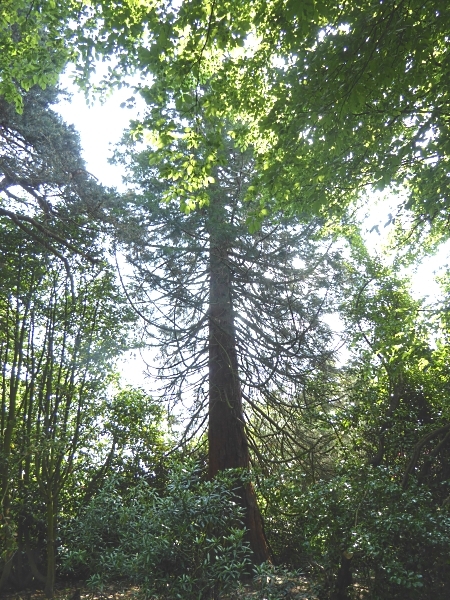 In the nearby shrubbery is a Giant Sequoia (Wellingtonia) Sequoiadendron giganteaum, with its lower branches sweeping the ground and rooting (called “layering”). Surprisingly, it is much younger than it looks. It is called the “Churchill Tree” because it was planted for the death of Churchill in 1965, which makes it only 53 years old, plus however old it was when it was planted. Younger than all of us! North-west of the playground, near the Monkey Puzzles, there is a tall Oak stump with two outcrops of wavy yellow bracket fungi. 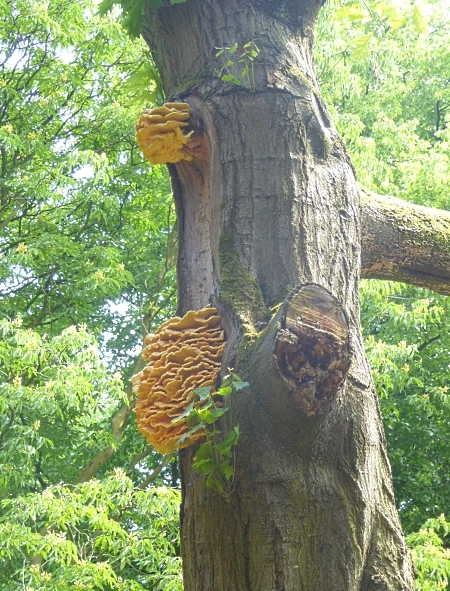 It’s a rather splendid fresh-looking growth of Chicken-of-the-Woods, also known as Sulphur polypore. It’s edible, but you’d need a ladder! 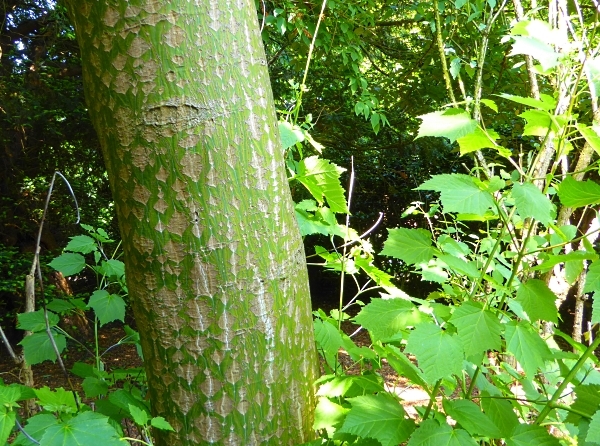 There is a Grey-budded Snake-Bark Maple Acer rufinerve on the other side of the path, behind the fence around the shrubbery to the south-east of the flower garden. 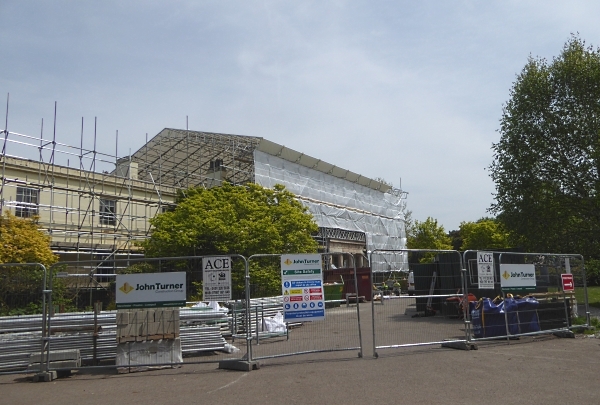 The Mansion House is being refurbished, and about time too. The Reader Organisation has raised over £5 million for the project, and they are planning to convert the garden theatre around the back into a wedding venue, which will provide continuing income. Happily, they will also be providing new public toilets, as the old ones have long been a disgrace. 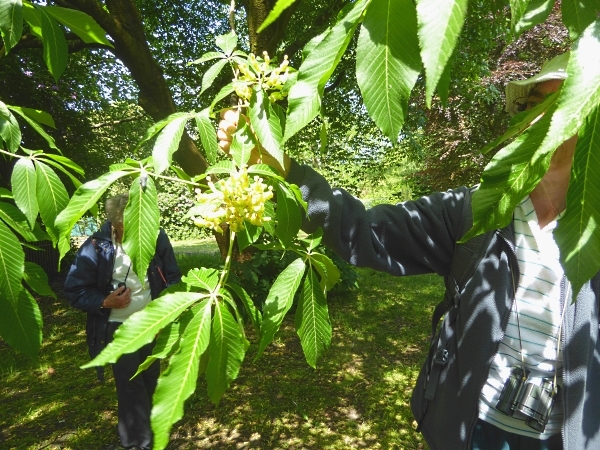 East of the Mansion House we spotted something with pale yellow flowers and five-fingered leaves that we identified as a Yellow Buckeye Aesculus flava. 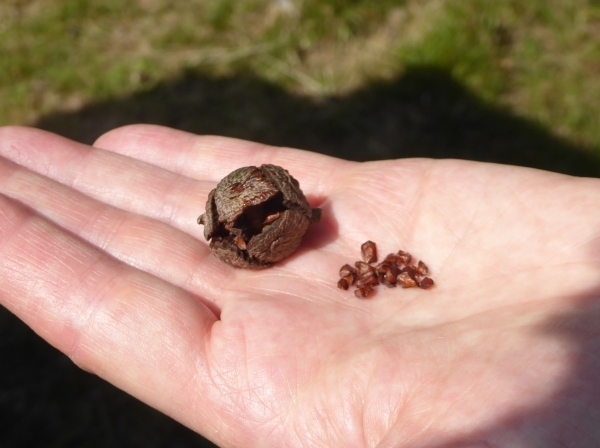 It’s in the same genus as our common Horse Chestnut, and Mitchell’s book says many Buckeyes are grafted onto a Horse Chestnut rootstock. 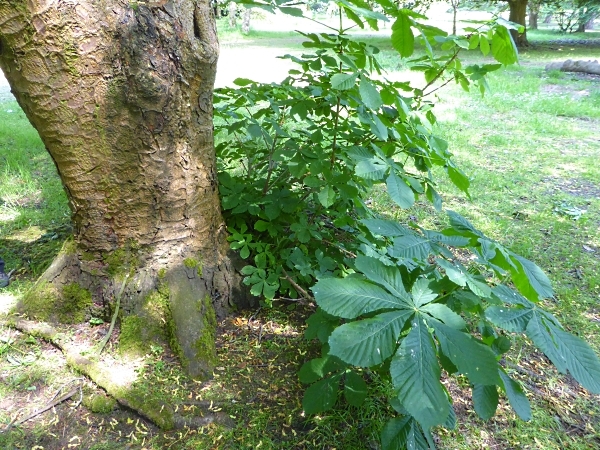 This one obviously was, with a very low graft, because Horse Chestnut leaves were sprouting out of the bottom. 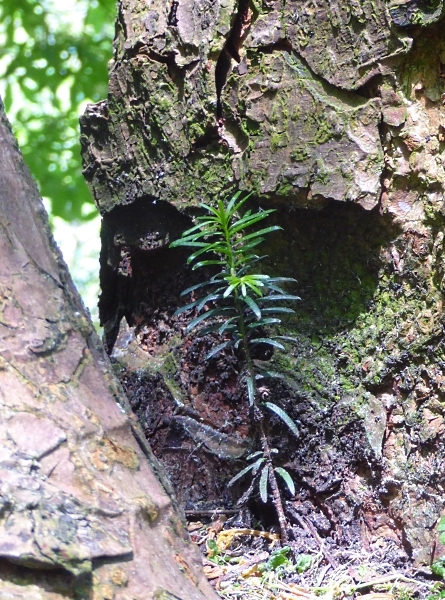 In fact, it was three trees in one because a tiny Yew had germinated in a fork at head-height. The Black Mulberry tree Morus nigra looks half-dead, but plenty of leaves are coming out and it seems to be thriving. 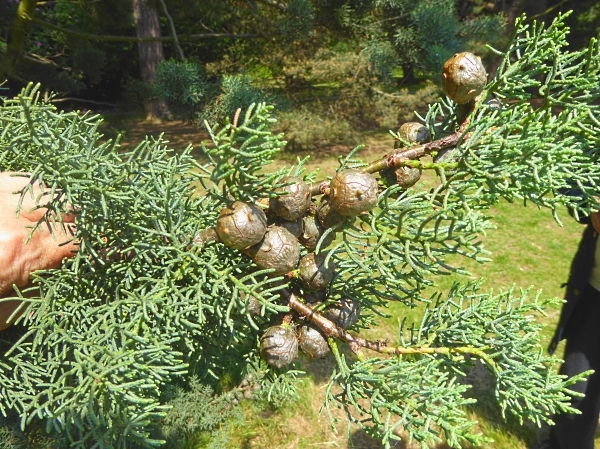 Near to it was some kind of young Cypress, with cones about ¾ inch (2cm) across, which were almost dodecahedral, with a point in the centre of each scale. We opened one, and there were lots of seeds inside, and the broken scales exuded resin. There was no particular smell. I looked it up later, and I think it’s a Smooth Arizona Cypress Cupressus glabra, which isn’t particularly rare. A clump of three Redwoods in the shrubbery south-east of the Mansion House had foliage a bit like Dawn Redwoods, so I think they are Coast Redwoods Sequoia sempervirens. We checked off some old friends for our year list: Douglas Fir; Japanese Red Cedar; the Golden Rain Tree, also known as Pride of India, which is hidden in a dark corner by the old loo block and shaded by Yews (this is tragic – someone should let some light in onto it); the Turkish Hazel outside the gallery; and the mighty Lucombe oak, Quercus x hispanica ‘Lucombeana’, a hybrid of Turkey and Cork Oaks. 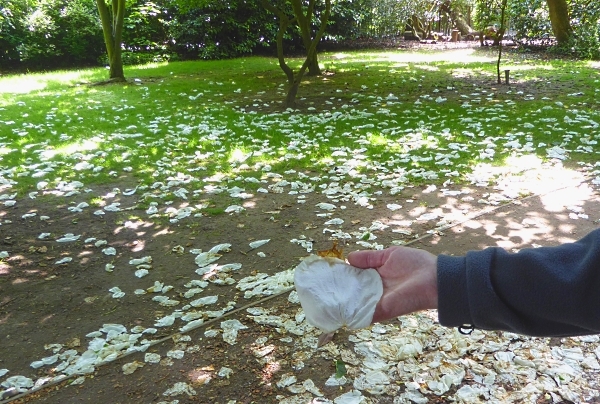 The Dove tree / Handkerchief Tree Davidia involucrata by the path around to the Old English Garden is now shedding all its white bracts, which give it the “pocket handkerchief” nickname. 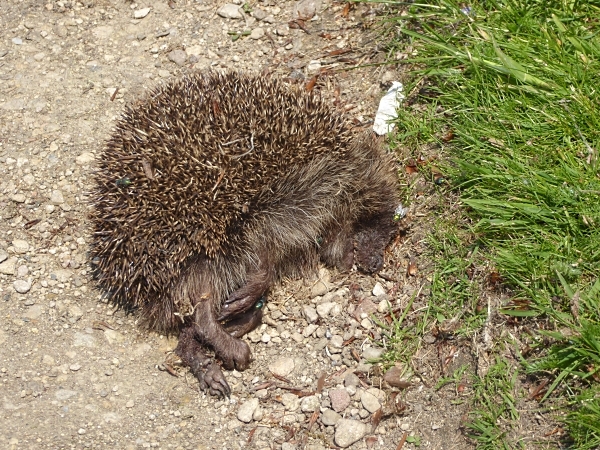 We lunched overlooking the flower garden, where the Corpse of the Day was a dead hedgehog on the edge of one of the lawns. The Old English Garden is rumoured (by Richie the Ranger) to have once contained every plant mentioned in Shakespeare, but I have no idea if anyone has checked recently! We did a quick walk-around, looking for some real oddities mentioned in a very old leaflet, but didn’t find them. 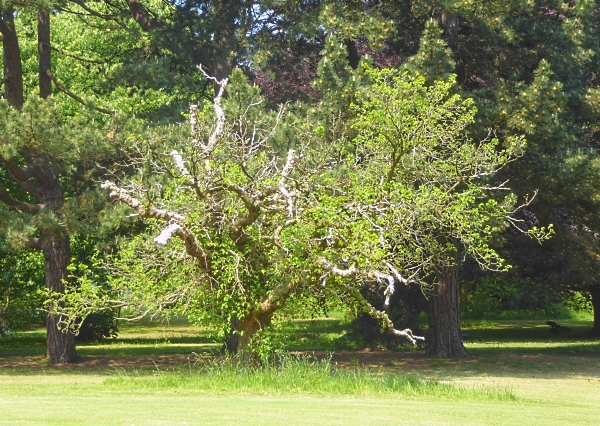 Then around by the Allerton Oak, which is at least 700 years old, but popularly reputed to be 1000 years old. It is now fenced off but still going strong, and produces thousands of acorns each year. Nearby is the moribund Cedar of Lebanon; the Shagbark Hickory Carya ovata, which is the Lancashire county champion for girth and height; and the young Paperbark Maple in the Rockery. 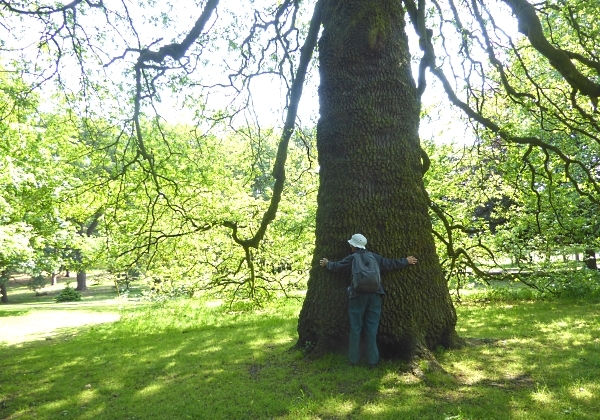 We stopped by the big Tulip Tree, hoping to see it in flower, but no luck. We hope for some blossom in Port Sunlight in two weeks time. There were slim pickings for birds on the lake. Moulting Mallards, two pairs of Coots noisily seeing off one poor timid Moorhen, Herring Gulls and feral Pigeons. 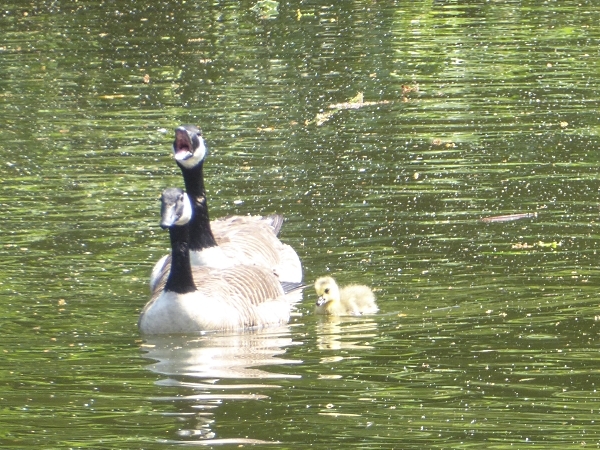 One pair of Canada Geese had a single tiny gosling, and one of the proud parents was announcing it to the world. Then we headed southwards towards the exit, by now hot and weary. The main path is lined by an avenue of notable trees, American Limes Tilia americana, also called the American Basswood. It’s listed in Mitchell’s book as rare, found only in a few collections, but here there are dozens of them. One of them is the Lancashire county champion for girth and height, although it’s hard to know which one, as they are all so uniform. So far on our Sunday walks we have “ticked” 73 bird species and 110 kinds of tree. Not bad for an urban area! Public transport details: Bus 86 from Liverpool ONE bus station at 10.23, arriving Mather Avenue / Ballantrae Road at 10.53. Returned on the 86 from Mather Avenue / Storrsdale Road at 1.55, arriving Liverpool City Centre at 2.25.